Eight folks came to our first meeting in 2013, and it turned out to be a crowded night, with us landing on a ‘buy one get one free’ night, so we had to wait and squeeze in (in contrast to our February meeting!). >I went over my annual presentation to the SMU gifted students boy’s conference – an enthusiastic crowd, as usual. Yes, young kids are still excited by space! (The SMU gifted students conference was early this year…usually it is in May but this year it was in January for the boys…. >We discussed the plans for getting additional copies of InDesign to help out with the conference paper editing task. I have a copy purchased by National, but this is more than a one person job, and The Mars Society is only allowed one copy, so we are still working on getting additional copies. >And we discussed the latest goings on on Mars, Curiosity, and Space news in general. Due to a coincidence of personal business, illnesses, and just bad timing, we had a smaller crowd than usual this month And, wouldn’t you know it, this was the month that the Spaghetti warehouse was nearly empty, and we GOT THE BACK ROOM! Yes, we haven’t gotten the big party room to ourselves in over a year. So we enjoyed the extra elbow room and the chance to have some privacy. >We went over the results of the Dallas Science fair, URC planning, convention planning and posters, as well as updates on the latest from Mars. >Three of our local members got to be judges at the Dallas Science Fair. Top high school science students presented projects on different areas – many, many different areas. Anyone who thinks that today’s kids do not have science smarts or are not interested in math and science anymore needs to come to this fair – there over a thousand high school kids, and nearly a thousand projects, many at a level of sophistication that i would be impressed to see from college students or even working adults. There was a mind boggling array of ideas and projects, and it was truly uplifting to see so much energy and sophistication in our young people. True, there were few truly space specific projects, but there were many closely related, and we gave our Curiosity Award to a young man who had done research into small, portable hydroponic gardening, as we felt that was very germane to space colony food growth. Our honorable mention runner up was another young man doing work on novel drug therapies for protecting the body from the effects of ionizing radiation. Judging this was a great experience, and a definite ‘let’s do this again next year!’. May thanks to Tom for setting this all up. We also have some other group projects, with us signed up for our next round at Moon Day, and Tom has some great ideas for improving our Rover activity from last year. 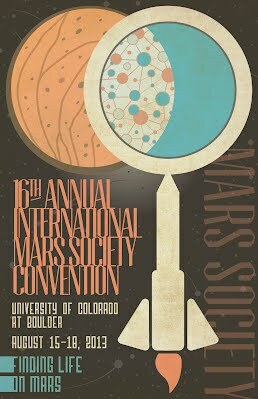 Our group is also helping with the University Rover Competition (URC) (two of us are signed up to volunteer in late May / Early June), and the Mars Society Convention. Despite the travel restrictions imposed on the government due to all the budget troubles in the news, a truly great line-up of speakers is taking shape for the next national convention in Boulder later this summer, and there are of course a year’s worth of history making science from Curiosity to catch up on.